The world-class Wallaby gold deposit, Laverton, Western Australia: An orogenic-style overprint on a magmatic-hydrothermal magnetite-calcite alteration pipe? Gold mineralisation at the Wallaby gold deposit is hosted by a 1,200 m thick mafic conglomerate. The conglomerate is intruded by an apparently comagmatic alkaline dyke suite displaying increasing fractionation through mafic-monzonite, monzonite, syenite, syenite porphyry to late-stage carbonatite. In the mine area, a pipe-shaped zone of actinolite-magnetite-epidote-calcite (AMEC) alteration overprints the conglomerate. Gold mineralisation, associated with dolomite-albite-quartz-pyrite alteration, is hosted in a series of sub-horizontal, structurally controlled zones that are largely confined within the magnetite-rich pipe. The deposit has a current ore reserve of 2.0 Moz Au, and a total resource of 7.1 Moz Au. TIMS U−Pb analysis of magmatic titanite and SHRIMP U−Pb analysis of gold-related phosphate minerals are used to constrain the timing of magmatism and gold mineralisation at Wallaby. Monzogranite and carbonatite dykes of the Wallaby syenite intruded at 2,664±3 Ma, at least 5 m.y. and probably 14 m.y. before gold mineralisation at 2,650±6 Ma. The significant hiatus between proximal magmatism and gold mineralisation suggests that gold-bearing fluids were not derived from magmas associated with the Wallaby syenite, particularly since intrusive events are unlikely to drive hydrothermal systems for more than 1 m.y. 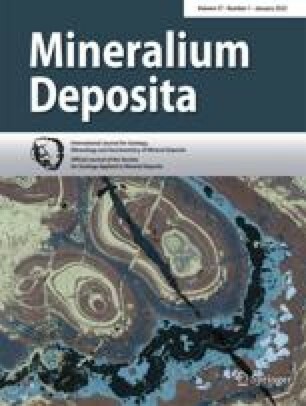 Analysis of the C and O isotopic compositions of carbonates from regional pre-syenite alteration and AMEC alteration at the Wallaby gold deposit suggests that AMEC alteration formed via interaction between magmatic fluids and the pre-syenite wallrock carbonate. The C and O isotopic composition of gold-bearing fluids, as inferred from ore-carbonate, are isotopically distinct from proximal magmatic fluids, as inferred from magmatic carbonate in carbonatite dykes. Thus, detailed isotopic and geochronological studies negate any direct genetic link between proximal magmatic activity related to the Wallaby syenite and gold mineralisation at Wallaby. The gold endowment of the Wallaby gold deposit, combined with the relatively low solubility of gold as thiosulfide complexes in low-salinity ore fluids at temperatures of about 300°C, implicates the influx of very large volumes of auriferous hydrothermal fluids. No large-scale shear-zones nor faults through which such large fluid-volumes could pass have been identified within the immediate ore environment, so fluid influx most probably occurred largely in a unit-confined, brittle-ductile fracture system. This was the ~500-m diameter AMEC alteration pipe, which was a brittle, iron-enriched zone in an otherwise massive conglomerate. During compressional deformation, the competency contrast between unaltered and AMEC-altered conglomerate created a zone of increased fracture permeability, and geochemically favourable conditions (high Fe/Fe+Mg ratio), for gold mineralisation from a distal source. This paper forms part of a PhD project at UWA, carried out by B.P.S, who was in receipt of a University Postgraduate Award. The financial and in-kind support of Placer Dome Asia Pacific is gratefully acknowledged, and the company is thanked for access to drill core from their Granny Smith operation, as well as for their permission to publish. Specifically, thanks also go to G. Hall, R. Keele, E. Maidens, S. Halley, T. Aung and J. Baulch, and all the exploration staff at Placer Granny Smith. Marion Marshall is thanked for her assistance with mineral separation, and the staff of the CMM and CGM at UWA, including R. Weinberg and R. and N. Vielreicher, are thanked for their help and assistance. Wouter Bleeker and Bill Davis at the geochronology division of the Geological Survey of Canada in Ottawa are thanked for the TIMS analysis of titanite. Ion probe analyses of titanite, monazite and xenotime were performed at the Western Australian SHRIMP facility operated by a WA university-government consortium with ARC support. The original manuscript was significantly improved by the helpful comments of R. Kerrich and an anonymous reviewer and the clear and incisive comments of the Editor, L. Meinert.